This finish is from a quilt top I made last December. The only reason I made it was because my husband bought me a new bigger cutting mat and I immediately had to cut out a new quilt on it. Then it sat around for awhile until I decided it should belong to a family member who has had a rough year. It's funny, I made this one with some of my very favorite colors and prints, but didn't realize how "masculine" it was overall. Or maybe I prefer gender-nuetral. 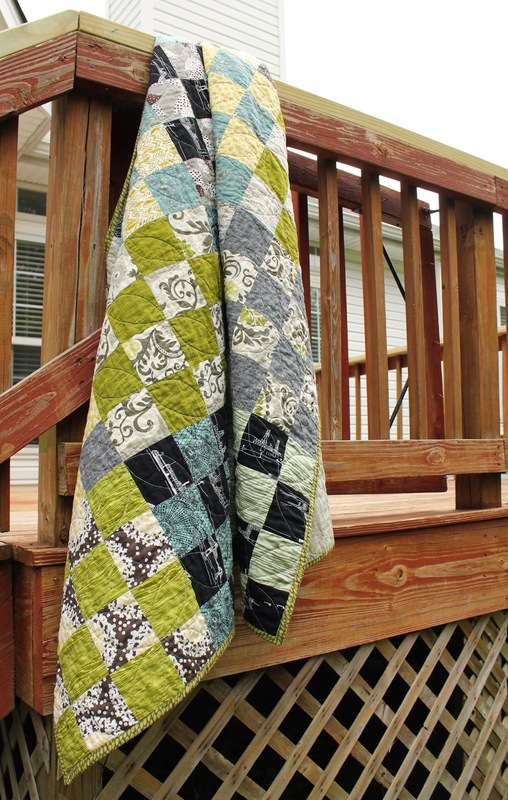 But it's also the exact color scheme of this picnic quilt, just way less saturated. Didn't mean to do that either. The St. Louis 16-Patch is another one of those designs made popular again on Intagram, and it really is a fun quilt if you are in the mood for something quick that showcases some favorite fabrics. I made mine a large throw with 20 blocks. In the tutorial, you end up with two blocks for each pair of fabrics, but I mixed around my pairings so that no two blocks are the same. I also got to try another new-to-me style of free motion quilting! 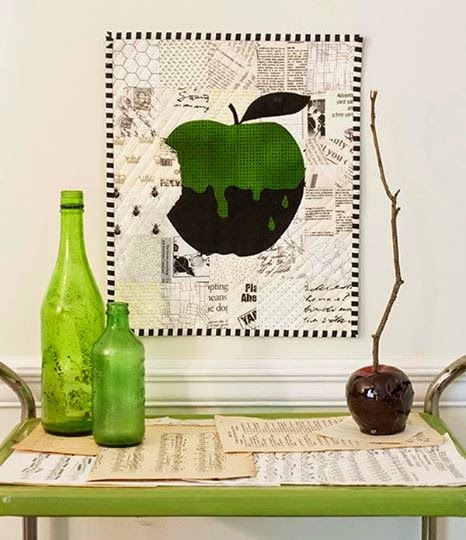 Elizabeth Hartman's orange peel tutorial made it so easy, and this design is perfect for it since the grid is already there for you. The peels were a little tricky for me to get consistently shaped at first, just because these squares require kind of large swoops, but I soon found the rhythm and I love the results. A lot. 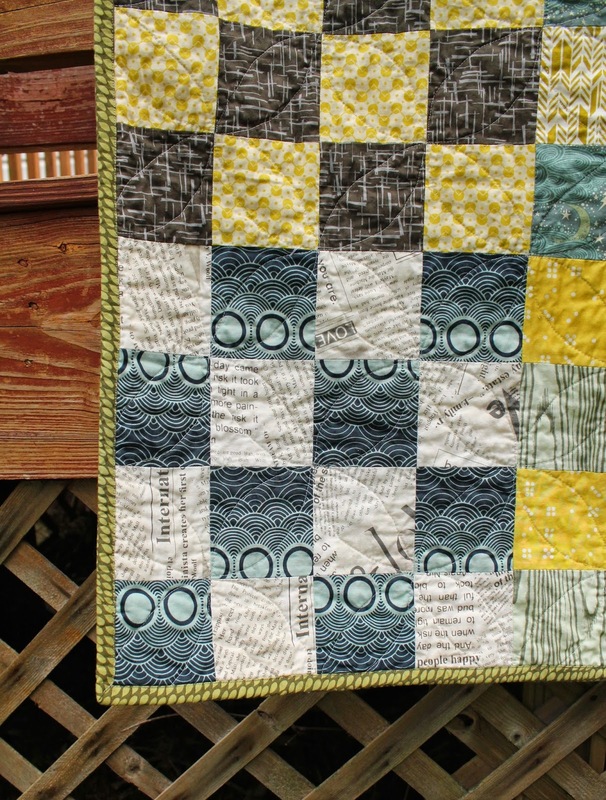 Here's how the quilting looks on the front. I also just wanted to include this picture because this corner block is my absolute favorite pairing of prints on the whole quilt. I love the way that blue Parson Gray print looks cut up like that. 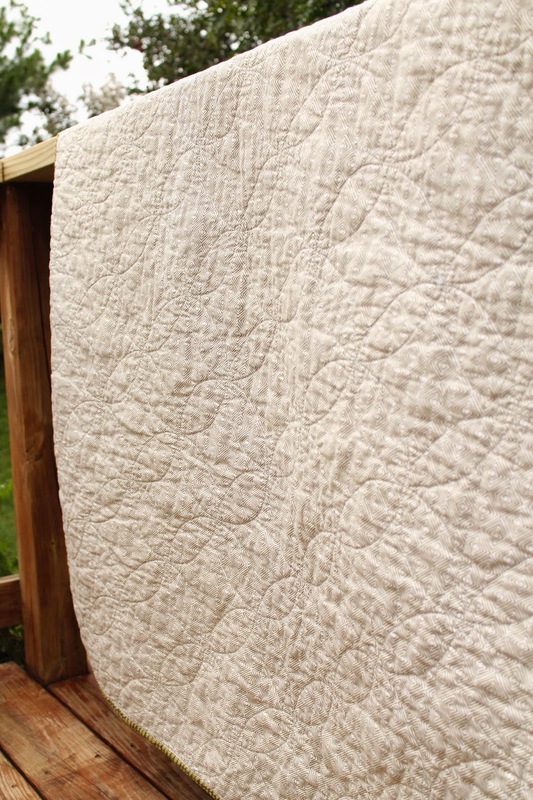 Now that this one is finished and has a new home, I only have one unfinished quilt top lying around. It's queen-sized though, so I'm not itching to baste it and quilt it any time soon... but maybe! Of course, since it is October, we have Halloween on the mind all the time, and I couldn't resist starting a Halloween-ish fall quilt. Probably won't get done this fall, but it sure is fun to work on. And if you are looking for more Halloween inspiration, I should tell you about an AWESOME new craft magazine that was just released from Rebel Craft Media. This adorably creepy mini quilt is just one of the great crafts featured. And it's not just quilty stuff, there are decorations and recipes and even fall cocktails. It's really pretty and well put together, and I'm especially proud because there's also an article in it featuring me! They interviewed me all about Film Petit and sewing costumey things for kids. So fun! You can get your digital copy here.